Collier's Encyclopedia (full title: Collier's Encyclopedia with Bibliography and Index) was a United States-based general encyclopedia published by Crowell, Collier and Macmillan. Self-described in its preface as "a scholarly, systematic, continuously revised summary of the knowledge that is most significant to mankind", it was long considered one of the three major contemporary English-language general encyclopedias, together with Encyclopedia Americana and Encyclopædia Britannica: the three were sometimes collectively called "the ABCs". P.F. Collier & Son Company first published Chandler's Encyclopedia: An Epitome of Human Knowledge with chemist William Henry Chandler as editor-in-chief as early as 1898. The edition of this Encyclopedia was published in only three volumes. Chandler notes in the preface that the purpose of this encyclopedia was to be manageable in size and sold for an affordable price. The goal for the encyclopedia was to be brief and provide one paragraph per subject. An example given by the author was if one was looking for an English or Italian poet, you would find them under their name and not a large article on English or Italian literature. P.F. Collier & Son Company published Collier's New Encyclopedia from 1902–1929, initially in 16 volumes and later in 10 volumes. Collier's 11 volume National Encyclopedia (1932–1950) replaced Collier's New Encyclopedia. In 1949 the entirely new 20 volume Collier's Encyclopedia replaced the National Encyclopedia. After Robert Collier's death in 1918, P.F. Collier & Son Company was bought by Crowell Publishing Company (later the Crowell-Collier Publishing Company). In 1950 Collier Books published the 20-volume Collier's Encyclopedia (full title Collier's Encyclopedia with Bibliography and Index). It was expanded to 24 volumes in 1962. Until its print edition ceased in 1998, Collier's Encyclopedia was sold almost exclusively door-to-door, one of the last big-ticket items of that nature in the United States.In fact in the 1930-50's one of the qualifiers for the door to door salesman to determine if one could afford the books, was if there was a telephone present in the household..To make 24 volumes more affordable, they were purchased one or two volume's each month over one or two years. For many families they became a status symbol. The 1997 edition has 23,000 entries with few short entries, as related subjects are usually consolidated into longer articles. A high percentage of the illustrations are in color, and more full-color illustrations had been added in recent years resulting in pictorial matter accounting for about two-fifths of the pages. Bibliographies are found in the last volume which also contains the 450,000 entry essential index. An annual Collier's Year Book was also published. In 1998 Microsoft bought the rights to Collier's electronic version and incorporated it into its Encarta electronic encyclopedia. 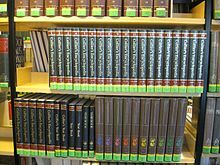 Atlas Editions (formerly Collier Newfield) retained the rights to publish the encyclopedia in book form, though since then, Collier's has ceased to be in print. A well-known comparison is that of Kenneth Kister, who gave a qualitative and quantitative comparison of Collier's Encyclopedia with the Encyclopædia Britannica and the Encyclopedia Americana. For the quantitative analysis, ten articles were selected at random (circumcision, Charles Drew, Galileo, Philip Glass, heart disease, IQ, panda bear, sexual harassment, Shroud of Turin and Uzbekistan) and letter grades (A–D, F) were awarded in four categories: coverage, accuracy, clarity, and recency. In all four categories and for all three encyclopaedias, the four average grades fell between B− and B+, chiefly because not one encyclopaedia had an article on sexual harassment in 1994. In the accuracy category, Collier's received one D and seven As. Encyclopedia Americana received eight As, and the Britannica received one D and eight As; thus, Collier's received an average score of 92% for accuracy to Americana's 95% and Britannica's 92%. In the timeliness category, Collier's averaged an 85% to Americana's 90% and Britannica's 86%. After a more thorough qualitative comparison of all three encyclopedias, Kister recommended Collier's Encyclopedia primarily on the strength of its writing, presentation and navigation. ^ a b c d e Chandler 1898, pp. xi-xiii. ^ Kister, KF (1994). Kister's Best Encyclopedias: A Comparative Guide to General and Specialized Encyclopedias (2nd ed.). Phoenix, Arizona: Oryx Press. ISBN 0-89774-744-5. Chandler, William Henry, ed. (1898). Chandler's Encyclopedia: An Epitome of Universal Knowledge ... New York: Collier. Wikimedia Commons has media related to Collier's Encyclopedia. This page was last edited on 27 January 2019, at 13:29 (UTC).